The cloudy appearance of water caused by the presence of suspended and colloidal matter. In the waterworks field, a turbidity measurement is used to indicate the clarity of water. Technically, turbidity is an optical property of the water based on the amount of light reflected by suspended particles. Turbidity cannot be directly equated to suspended solids because white particles reflect more light than dark-colored particles and many small particles will reflect more light than an equivalent large particle. Basically, this means that turbidity is closely related to the amount of light scattered at 90 degrees when a light source is shined through a sample.� Our measurement process takes advantage of the relationship between optical scattering and turbidity to take measurements of the turbidity of liquid samples. 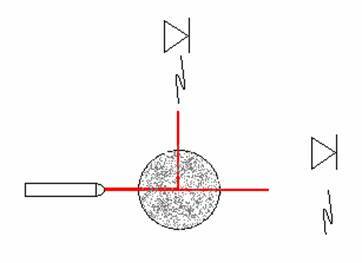 When particles are suspended in water and a light is shined through the sample, not all of the light will pass straight through the sample.� Instead, the light will reflect off of the suspended particles and some of the light will exit at a right angle to the direction of entry into the sample.� Our meter uses a laser pointer as a light source, and two photodiodes as detectors for the intensity of the transmitted and refracted light.� The basic setup is shown below in figure 1. Figure 1: schematic concept of turbidity meter. By measuring the voltages off of both of the photo diodes, we can derive a function which calculates turbidity from the ratio of the voltage across the 90 degree sensor to the voltage across the 180 degree sensor. In order to prove that our idea was sound, we used equipment in one of the civil and environmental engineering labs to test out the design.� We mixed kaolin clay and water to create samples of varying turbidity.� We measured the samples on a calibrated turbidity meter, and then took measurements from our device.� The results are shown graphically below in figure 2. It is apparent that there is some function which will define the turbidity of a sample as a function of the voltage ratio from the sensors.� As it turns out, a quadratic least squares regression line is a very close fit to the data. The sensitivity of the instrument should permit detection of a turbidity difference of 0.02 NTU or less in waters having turbidities less than 1 unit. The instrument should measure from 0 to 40 units turbidity. Several ranges may be necessary to obtain both adequate coverage and sufficient sensitivity for low turbidities. 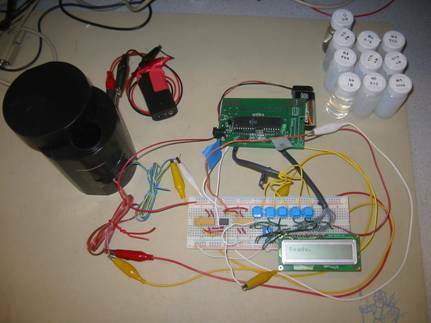 These standards are probably beyond the capabilities of the sensors that we chose and the ability of the microcontroller to process.� However, the point of this project is not to create a perfect meter, but rather a viable low cost alternative.� Despite the fact that our resolution does not necessarily live up to EPA standards, the meter can still be quite useful in a laboratory setting. The principle of turbidity measurements was described in the above section.� In practice, taking these measurements turned out to be far more difficult than was imagined.� The first large problem that we encountered was the quality of the samples which we were attempting to use to calibrate the meter with.� Because we had to work on our project in the 476 lab space, we needed to get samples of known turbidities which were contained in glass cuvettes which we could bring into the lab.� We measured the turbidity of our samples in a calibrated turbidity meter in a civil and environmental engineering laboratory.� The standard sample which is used to calibrate turbidity meters is formazin in water.� However, formazin is a carcinogen and expensive, so we looked for alternative materials use. Our next attempt at finding stable samples also went sour.� Regular 2% milk does form a homogeneous solution in water.� We mixed milk with water to create samples of various turbidities, all of which were stable.� However, milk is an organic substance which means that is spoils over time.� Despite our best refrigeration efforts, after one night, the sample went bad and the turbidity changed. Our final effort was clearly the best.� We diluted a hydrophilic cutting oil into water to make stable, homogeneous, non-organic samples which do not settle out over time.� The samples are shown above in figure 3.� The turbidity remained stable over a period of several days (and counting�). 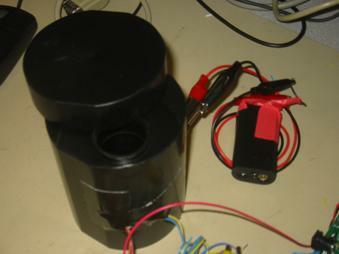 In order to try to minimize the movement of the sensors, light source and sample, James created a hard nylon container for the meter.� This container is shown below in figure 5.� There are holes drilled into the sides for the photodiodes and the laser pointer.� The precise machining keeps the sensors from moving with respect to the light source.� However, the diameter of the hole for the cuvettes was slightly too large.� The results was that the placement of the cuvette in the holder could drastically adjust the readings on the sensors.� Because the laser is a highly correlated and directed light source, the angle at which the beam hits the glass changes the amount of light which is reflected and transmitted.� In order to combat this, we found a new, disposable cuvette (the ones shown in figure 3) which was slightly larger in diameter.� James machined the nylon holder to within 1/1000 inch precision.� The cuvettes cannot move with respect to the laser, and the readings are very steady. After moving to the black nylon container, we also decided to focus on the entire range of turbidity (0-1000 NTU) rather than just the range 0-50 NTU.� We had been focusing on increasing the resolution in the low range, but we decided that a more reasonable goal for this project was to try to get good (not great) readings across the entire scale.� Although we have not had the opportunity to test the resolution of the new housing for sample in the range 0-50 NTU, we have high hopes that the new housing will also improve resolution in this range. We chose a bias voltage of .5 V for the 180 degree sensor.� The gain we chose was R3/R1= 150.� This allows to resolve the 180 degree sensor into (.5472-.5296)*150*1024/5V = 845 levels.� This was more than enough for the required resolution. However, as it turns out, nothing which was just discussed is actually included in our final project.� Although we spent a lot of time creating these amplifiers, when we changed to the black nylon housing, the sensors began picking up a larger portion of the laser light.� The swing in voltages was much larger than the data we originally planned on.� We ended up only using the non-inverting amplifier (figure 6) implemented with a LM 358 dual op amp.� We chose a gain of 5.� This sufficed to read the sensors accurately. The software backbone is a state machine (see Overall State Diagram in Appendix) running off several timers. There are a total of five timers counting in ms, each of which is reset to zero according to different conditions. time1 counts to 5 ms, dictating the frequency at which the ADC registers are read. Because there is more than one ADC input (two in the final design), alternating between inputs in an orderly manner is necessary. time2 counts to 3 s, after which all completed states return to the �wait� state displaying the default �Ready.� message on the LCD. time3 controls the LED to flash during recording mode. This allows to user to know at a glance if recording is completed without having to read the LCD output. time4 debounces the increment and decrement buttons every 120 ms. This period is reasonably larger than the usual 30 ms used in button debounce because the button state machine implements two scales of increment or decrement according to the duration of the button hold. Also, the buttons used are different from the usual lab push buttons. time5 counts how long the button is held in the button state machine. The trickiest part about writing the program is putting the states of the overall state machine together. The best way to describe the state machine is to outline how a user operates the project. The moment power is turned on, the machine stays in the �wait� state. States that return to the �wait� state have their final LCD messages staying on screen for 3 s before the default �Ready.� message appears again. Pressing the �Record� and �Calibrate� buttons take the user to the respective states. The user can press �Cancel� to return to the �wait� state, nullifying any readings or calibrations. However, if the user is already in the �wait� state, the �Cancel� button displays the regression coefficients. This was implemented as a handy debugging tool. In the �Record� state, the ADCH and ADCL registers are both read to obtain 10 bits of accuracy. The ADMUX register is appropriately set to use AVcc as the reference voltage as well as alternating between the two analog inputs from the 90 and 180 degree photodiodes. 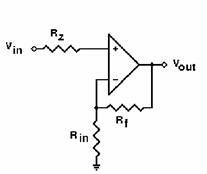 Because five thousand of each ADC reading is taken for each sample, the noise fluctuations are virtually eliminated after averaging. The average ADC readings from the 90 degree and 180 degree inputs are used to compute their ratio, which is used in the regression equation to obtain the corresponding NTU value. This value is displayed on the LCD and the machine returns to �wait�. Also for debugging purposes, the normalized ratio is displayed. The normalization is discussed below. In the �Calibrate� state, the machine is sent to the �Record� state to obtain a certain number of calibration data readings, the default being eight data points. After each calibration reading, the machine goes to the �Input� state instead of calculating and displaying the NTU reading as before. In the �Input� state, the user adjusts the NTU reading as shown on screen to the desired calibration value. This adjustment uses the button state machine (see Button State Diagram in Appendix). In all these transitions, the �Record� button is used as a �Confirm� button. The button state machine allows for increments and decrements in two ranges for the convenience of the user. A button tap corresponds to +-1 NTU while a hold causes a rolling +-10 NTU. After the input is confirmed, the machine goes back to �Calibrate�. 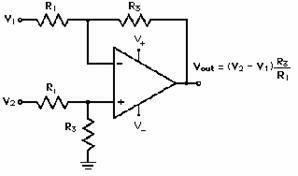 If necessary, it transitions to �Record� to obtain more calibration values. Otherwise, least mean square regression is calculated for the ratio and NTU data points. The end result is three coefficients for an order two regression curve, where the input is the ratio and the output is the NTU. The regression coefficients are stored permanently in EEPROM, so each turbidity meter only needs to be calibrated during the first use. Our initial goal was to use two regression curves to calculate the turbidity of the samples from two sets of different analog amplifications. The plot of NTU value against reflected/transmitted ratio showed that smaller NTU values could benefit with higher turbidity resolution if they used greater amplification and a separate regression curve from the larger NTU values. To achieve this, the software was initially written to accommodate readings from four analog inputs (PINA.0 to PINA.3), and correspondingly, two ratios from differently amplified inputs. Also, code was written to obtain a second regression curve. After taking readings from any particular sample, the software decides whether to use the low range or high range regression curve based on the calculated turbidity value. For example, a turbid sample would have a high ratio beyond a certain threshold, and the program would choose the high range regression coefficients to calculate the turbidity. Unfortunately, as previously mentioned, the photodiodes exhibited too much fluctuation using the first housing design and ultimately resulted in our decision renders to operate on a single large range. Thus, the final version of the software only implements one pair of ADC readings, one ratio and one regression curve. An interesting phenomenon we noticed was that the MCU exhibited different arithmetic precision for floating point operations in different ranges of numerical values. Floating point multiplications and divisions involving numbers much smaller than one severely deviated from expected results. Surprisingly, scaling those small numbers by a constant factor into the range between one and ten greatly improved the accuracy. Because the measured ratios are all smaller than one, we subtracted a constant of .5 from each and scaled the result by ten to put them between one and ten. This method greatly improved the accuracy of the calculated regression coefficients. The code in this project was written entirely by us, with reference to ECE 476 lecture material. Because 3000 ADC readings are taken in intervals of 5 ms, our meter gives a NTU value in 15 s. In comparison, a commercial turbidity meter gives a stable NTU reading between 15 and 30 s. To rigorously prove the accuracy of our meter, we conducted many trials to compare the turbidity of samples measured with a commercial meter against values calculated with our meter. The following table shows a typical run with nine samples with turbidity ranging from 99 to 1005 NTU. The voltage readings off the 90 and 180 degree photodiodes are measured, and their ratios are calculated. The final column of the table shows the calculated turbidity from our meter using the second order regression equation. A regression curve is also plotted for the above data. Here, the R2 value of 0.9913 indicates a good fit of data to curve, where R2 = 1 represents a theoretically perfect fit. As can be observed from both the table and the plot, the turbidity measured with our meter is mostly in the ballpark of the actual measured turbidity. Even though our meter cannot always guarantee the correct turbidity or any fixed accuracy, our project proved that the concept of using reflected/transmitted light voltage ratios to calculate turbidity is feasible and robust enough to operate over a reasonably large turbidity range. While our final version of the project works reasonably well over the range 0-1000 NTU, we were not successful in creating a device which can accurately measure turbidity with high resolution between 0-50 NTU.� We did not get a chance to try the final version in this range, and hopefully we will see the same consistent results at lower turbidities that we did at higher values. 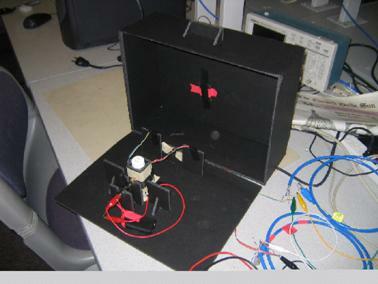 Some of the problems we encountered could possibly be resolved by making simple changes in the hardware.� For example we had problems with reflections off of the glass cuvettes from the laser.� A non-correlated light source would minimize the effect of these reflections.� Also, the photodiodes which we chose are tuned for maximum response in the infrared region.� We used a red laser.� We could either choose a light source in the infrared or chose more appropriate sensors. As electrical engineers, we must always work with the IEEE code of ethics in mind.� In the context of our project, several important points applied.� First, we recognize that our meter can be used in situation where failure can be harmful to human health.� Water quality measurements must be accurate.� We attempted to design a device that gives consistent, accurate readings and will not fail.� However, when our design failed to reach the appropriate calibration standards, we were sure to honestly disclose that information.� Although we were not offered any bribes, we would not have accepted them had they been offered.� During the design process, we often sought the opinions of teachers and teaching assistants on the viability of our project.� Also, we attempted through the spirit of collaboration to help our colleague James advance his professional career.